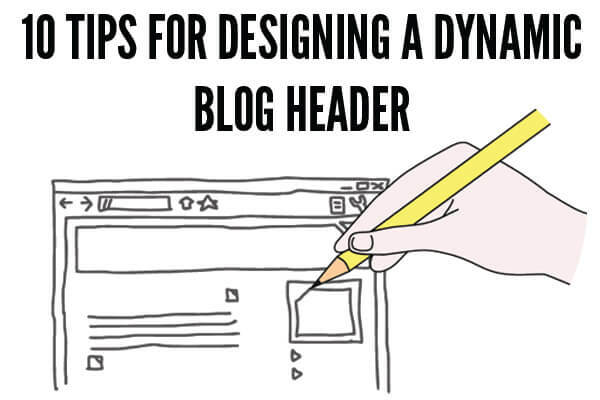 The header of your blog is the first thing your readers lay their eyes on. It sets the tone for your content and gives them a feel for who you are and what your site is all about. Myself, I've redesigned my header probably half a dozen times in three years. As my taste and style evolves, and as I get a little better at design tricks, I've been able to update it and tailor it to my clearest vision of what I want. I believe that a blog header is one of your greatest tools for creativity and self expression on your site – so have fun with it! Experiment with different fonts, colors, designs, sizes and artwork. 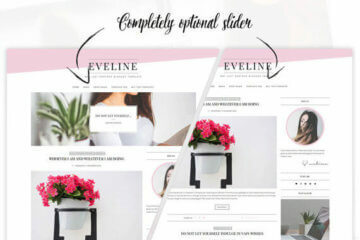 Keep in mind that the rest of the design elements on your blog should compliment or at least not compete with your header. 2. Do not have your header take up the entire space “above the fold” on your site. Above the fold means anything you can see before you have to scroll down. You want your header to be the lead in like a magazine title, not the cover of a book. 3. Use color with care. Pops of color are a great way to draw the eye in and express your personality. 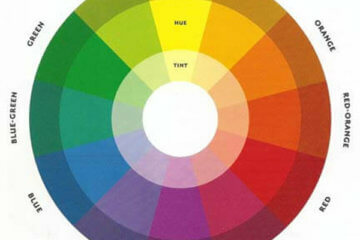 Spend some time trying out different combinations to see what looks good. Maybe use photographs or illustrations! 4. Black and white is also a classic choice. You can create a very graphic feel or use only text as your header. If you decide to use text only, why not buy (or download for free) a really cool, unique font? 5. Keep simplicity in mind. Simple doesn't mean boring, and simple doesn't mean without detail. Simple means purposeful, direct and clear. 7. Take your time. Good design can take time, and it can be slow process to finally create the perfect look. Start with something that works, and don't be afraid to change it little by little. 8. Consider hiring an artist or graphic designer. We're not all good at everything. You might be an excellent writer and a great photographer, but lag in graphic design – and that's fine! (Know your strengths, I say!) I hired an illustrator friend to create original art for my header, and now I have a personalized look that totally suits my style! 9. While making your header too big is a no-no, size does matter. Perhaps you prefer a smaller logo in the upper right hand corner, or a horizontal design that spans the width of your site. Just make sure it's easy to see. Play around with the size and orientation (left, right, center) to see what works with your other design elements such as pages, columns and share buttons. 10. Get personal. Think about things you like, that maybe represent your style (or not). Places, objects, photos, little memories or favorite nick-nacks. Try and translate something close to you into your design for an added element of originality and spark. Also, I must, must .. get rid of the crazy background on my blog. My header was a collaborative effort! My friend is an amazing artist but he had never done any fashion illustrations before. I gave him a few of my outfit photos and a general idea and he did a wonderful job. I’m actually thinking of updating my banner soon. Maybe by just changing the center illustration and making it a tad bit smaller because it does seem to take up too much space! Super duper cool that you included your own blog in the round up. Super helpful. What about sites like SF Girl By Bay, Designlovefest and Oh Joy!? My header is my own illustration. While the blog tells more about everyday life working in the magazine and my own daily fashion documentary, I still draw whenever possible. The two girls of fashion week in the header are the ones to remind me what I love doing most. i just redesigned my blog header, but might tweak the design even further after reading these tips. this article is amazing, so inspiring! Awesome tips! I am in the process of redesigning my blog and these are awesome ideas since I am not very artistic.. I need to hire a designer. Mine is too plain! I’ve played around with photoshop but still haven’t been able to do what I want. Agree with everything! That’s why my blog makes me so proud, I love my header, it’s simple and it’s literally a representation/illustration of me = unique! @MonicaP we like your crazy background! It gives your blog personality, super cute. I’m always updating my header but only to adapt to the season. I always use my own illustrations too and use to have a really big header to make an impact but now I’ve made it smaller whilst still keeping in my illustrations. this was so helpful! i wish i had the creative to some up with something great. mine is just a picture of my curtains that i took in my room.. hahaha i’ll have to be more inventive!! I hired a graphic designer to design my header! I love it & the sparkly starfish fits me perfectly! I am a fashion blogger by night and a graphic designer by day, so I am constantly reworking my blog design. I have recently been thinking about taking down the grey & white chevron stripes that are the background of my blog and changing things up again… Haven’t made up my mind yet, but I always love changing my look! My font is the favorite thing about my header! Had my graphic designer friend helped me out with my header and blog layout…I love it now! Great examples! This was very helpful. I might go play around with my header. I really need to make a design for my header. Thanks for the tips! I wanted to revamp my blog a bit and I was sort of thinking of changing my header. Hope you guys could check my blog out for suggestions. It would really help. I hired a graphic designer to do the header for my blog. Basically she just tweaked my logo, and kept it all in black and white, which I love! It’s simple and stylish, which reflects the blog’s beliefs! here’s my blog to see some works. Simplicity is definitely key. Something chic yet eye catching is always a great formula. I like The Misty Mom’s blog header and overall design! Great information! My blog header is pretty big, but not overpowering I think. I kind of like making that big statement right away to juxtapose my simple style. Let me know what you guys think! This is very timely! I’ll be updating my blog header and this just gave me an idea! Thank you for sharing this! I made my own in photoshop 2 years ago. I’ve kept it the whole time apart from having another one for about a day before I decided I want to keep the original. It’s very true to me, lots of colour and a collage effect with letters ripped from magazines. also with the bow added to tie in with the name. I’ll probably make a new one some day but I’m happy with this for now. Amazing tips! I just updated my header today! Any feedback would be greatly appreciated! I changed my Header this year , late Summer. I’m quite happy with it. In the past I played with the background and cool like wallpapers but then I realized that, that only makes it worse (for me personally) picking a colour that people than can read easily, so I decided to just go with the white wallpaper. I used to use Picnik to do my headers but since the website closed now I used PicMonkey that is almost the same thing, the website is slowly growing. But I did wish I had a better computer in order to have like photoshop and stuff. Oh well maybe one day. Great tips, very helpful. Planning a new header for for the New Year. I’m a visual person so a good and catchy header keeps me interested. And knowing this I still haven’t really done much to make my header any better. I couldn’t agree more with this article. When people visit your blog it’s like coming into your home. Taking time to put effort into the appearance of your blog will go a long way and keep visitors coming back. I am currently accepting freelance graphic design work. If any one is looking to refresh their blog’s brand. Great post, those are really useful tips! Since I’m a designer, I love playing around in photoshop and creating! I did my own final header almost a year ago and it’s a keeper; it’s personal, graphic and really matches my blog’s style. Few days ago I also did a site redesign and header for my friend (http://www.mij-a-porter.com), it turned out great! If anyone needs help with designing, feel free to contact me. These tips are really helpful. I’m currently setting up my blog and hopefully I can have it looking good thanks to your tips.